Few things are more memorable than sitting by an outdoor fire on a summer night. We love sitting with our family and friends around a fire roaring in our fire pit. The smell of burning wood mingles with the scent of fresh grass, fireflies blink with light, and the kids line up to roast marshmallows and make s’mores. It’s the magical stuff that lasting family memories are made of. Fire features are becoming one of the “must haves” for many of our clients who are planning outdoor spaces, but choosing the right features can sometimes pose a dilemma. Do you want a portable chiminea, a built-in fireplace, a gas fire table or a circular fire pit? 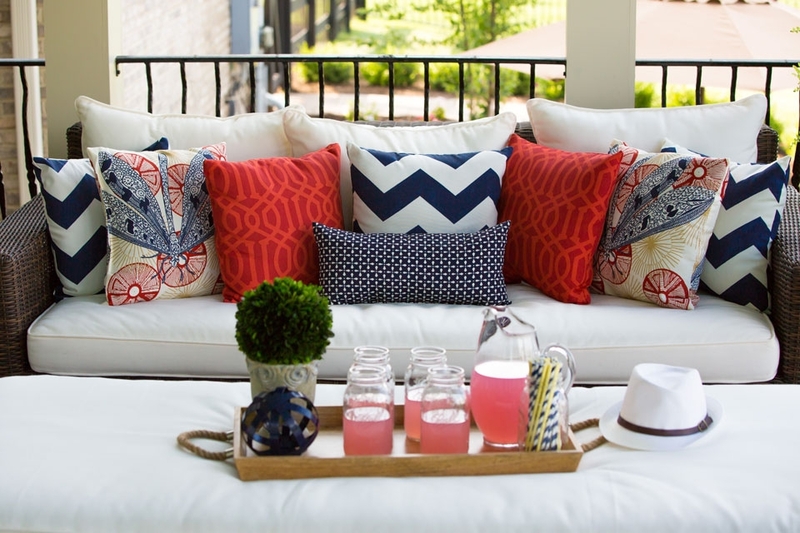 Each has its advantages and purpose in a well-considered outdoor space. Here are some of our ideas on how and when to use these different fire features in your outdoor design so you and your family can enjoy all that a fire element can bring to your outdoor living. A fire feature can be the focal point of your outdoor design. Whether you’re choosing a sleek contemporary gas fire table or a wood-burning fire pit, placement of the feature is critical. Be sure to consult city codes to find out whether you need a permit and whether restrictions exist on where you can put the fire element on your property. Although it varies by municipality, gas burning fire features can typically be placed anywhere, but most building codes require a wood-burning feature to be placed at least 10 feet from any vertical structure. When using a wood-burning fire feature, test wind patterns in the yard with a portable grill to check smoke flow direction. Even if you’re using a gas-powered pit that doesn’t emit smoke, a continual stiff breeze can direct the heat uncomfortably onto half your guests while the others won’t get warm, so keep wind patterns in mind. Both a fire pit and a fireplace provide a visual focal point while giving off warmth and light. Which is better? Well, it depends on what you’re looking for. With a fire pit, you can entertain more people at one time. 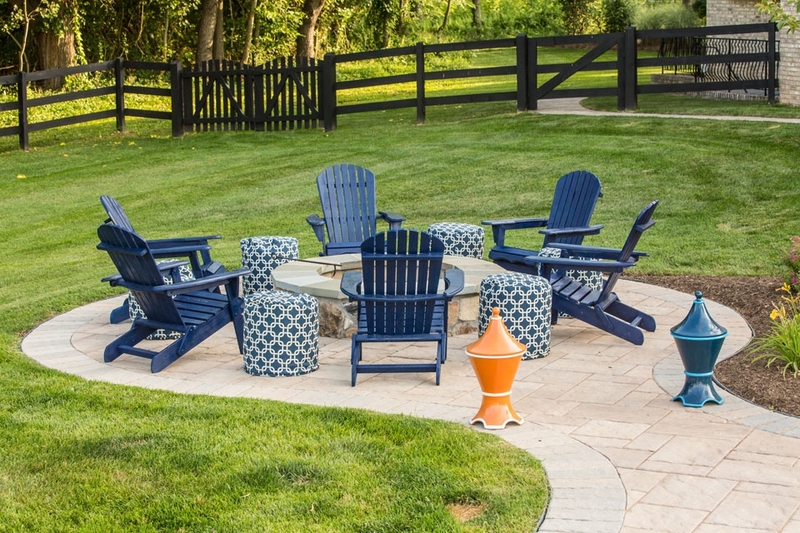 For larger gatherings, especially those with children, a fire pit offers built-in seating for everyone to enjoy at once. There is nothing that says “summer camp” more than sitting around a great stone “campfire” pit telling stories, cooking food, singing songs and laughing. Fireplaces can warm four to six people at a time, making them perfect for smaller groups. They also don’t take up as much space as a fire pit, and can evoke more of an elegant, old-fashioned home feeling. Any time you’re dealing with a fire feature, safety should remain your No. 1 concern. Before any work is done, check with your local municipality about safety codes to avoid costly design mistakes. If you’re using gas, be sure the contractor can run and install gas lines using noncombustible materials. If you’re having a fire pit built over existing hardscapes, make sure it’s on a noncombustible, solid, steady surface such as a stone or brick patio. Never put a fire pit directly on or near a wood deck. If you do have a wood deck, keep it on a fire pit pad, stone slabs or bricks over the wood. Once you’ve determined where the fire feature will be placed, you can integrate the element into the design to create a cohesive outdoor living space. The options are beautiful and depend on the look you want to achieve. Among your choices are natural stone, brick, a stucco-finished fireplace or a freestanding stone and metal fireplace. If you go with a gas burning fire element and you want a more contemporary look, consider adding colored fire glass to the firebox to create a spectacular glow in your favorite color. When considering seating, place it at least 3 feet from the fire feature so everyone can be at a comfortable distance from the heat source. Need help navigating these decisions? Grace Thomas Design excels at creating outdoor spaces that integrate fire elements. We know how to work with contractors to ensure that your fire element is safe and aesthetically pleasing. We can create an outdoor space that you and your loved ones can enjoy now and for years to come. Email us today and let us help you get started.